I spent the weekend getting my Wilderness First Aid recertification in a course taught by the Wilderness Medical Institute. Now that the course is done, I intend to update my first aid kit with a few new items, especially for wound care. Here are WMI’s recommendations for dealing with a wound in a wilderness setting, as well as the appropriate supplies. First, control the bleeding by applying direct pressure to the wound. Protect yourself from any blood-borne pathogens (HIV, hepatitis, etc.) by donning a pair of protective nitrile gloves. Bleeding will usually subside within 10-12 minutes as the body’s clotting mechanism takes effect. You can elevate the wound as well, though the latest evidence shows that this has no real beneficial effects in stopping the bleeding (though it doesn’t do any harm, either). Once the bleeding is controlled, your next goal is to prevent infection and help promote healing. First clean around the wound with soap (if you have it) and water, then rinse the area around the wound with clean, drinkable water. Next remove any foreign objects (dirt, debris, etc.) from the wound. You can do this with sterilized tweezers (heat the tips up until they glow, then allow sufficient time for them to cool) or by gently brushing out the wound. Your last cleaning step is to irrigate the wound with at least a half liter of disinfected water. 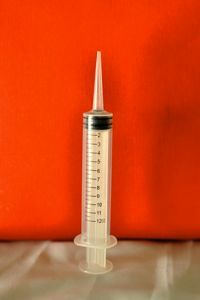 The only truly effective way to do this is with an irrigation syringe (pictured), which generates sufficient pressure to fully cleanse the wound. the wound closed. Once closed, you want to cover the wound with a protective dressing that keeps the wound moist to promote more rapid healing. 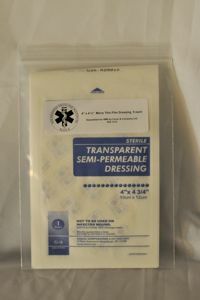 WMI recommends a transparent semi-permeable dressing, which sticks to the skin around the wound and is made from a see-through transparent material that allows you to check on the injury without removing the dressing. For maximum adhesion, you may want to consider applying tincture of benzoine to the skin around the wound. Change the dressing at least once every 24 hours and watch it for signs of potential infection, which include redness around the wound, swelling, pus formation, and in cases of serious infection, red streaking away from the wound, swollen lymph nodes, and fever. Seek medical attention immediately if an infection shows no signs of improvement within 12 to 24 hours.